Google makes a lot of money from online advertising. In the twelve months ended June 30, 2011, Google made $33.3 billion in revenues. Of that, 97 percent ($32.2 billion) was from advertising. WordStream, a provider of software for keywords and pay-per-click marketing campaigns, has done research to discover which keywords receive the highest costs per click (CPC) in Google AdWords. WordStream compiled the data using its own Google Keyword tool to determine the top 10,000 most expensive keywords over a 90-day period. The keywords were organized into categories by theme. 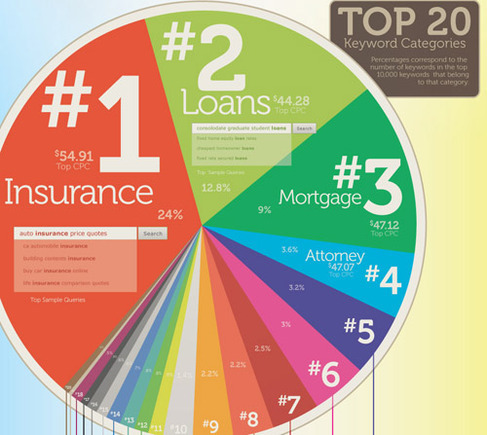 The largest keyword categories were determined by the number of keywords within each category, as well as monthly search volume and average cost per click of each keyword.